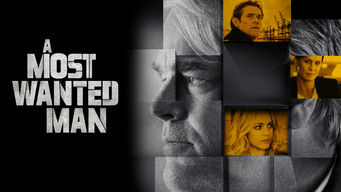 How to watch A Most Wanted Man (2014) on Netflix Singapore! Sorry, A Most Wanted Man is not available on Singaporean Netflix, but you can unlock it right now in Singapore and start watching! With a few simple steps you can change your Netflix region to a country like Germany and start watching German Netflix, which includes A Most Wanted Man. We'll keep checking Netflix Singapore for A Most Wanted Man, and this page will be updated with any changes. A Most Wanted Man is not available in Singapore BUT it can be unlocked and viewed! A half-Russian, half-Chechen man, brutalized by torture, arrives in Hamburg, where he seeks a British banker's help in recovering his father's estate. When a Chechen immigrant slips into an international war on terror, monsters and heroes aren't mutually exclusive. There is a way to watch A Most Wanted Man in Singapore, even though it isn't currently available on Netflix locally. What you need is a system that lets you change your Netflix country. With a few simple steps you can be watching A Most Wanted Man and thousands of other titles! Watch "A Most Wanted Man"